How are you celebrating? I will be tatting during lunch at work and enjoying some chocolate. I’d love to see pictures of what you tat today. 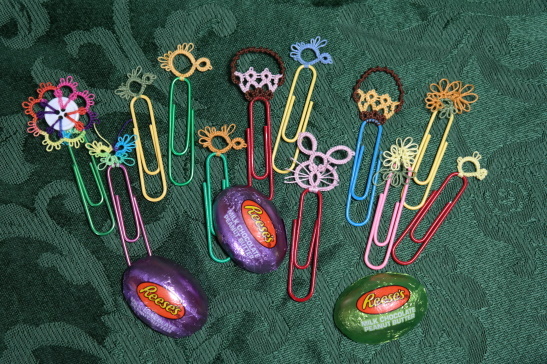 Wanda shared her lovely bookmarks and reminded us that part of the International Tatting Day tradition is also to eat chocolate. I hope you have enjoyed a wonderful Saturday! We had a nice guild meeting this afternoon and are gearing up for the workshop later this month. I am really excited for it. It’s time to prepare my tatting kit for my classes and my list of threads and books to look for with the vendors. I love getting to see all the thread color variety in person! The round robin is getting a reboot in May. It was great meeting the new guild members and catching up with the others. I’m working on a dragon lanyard for my name badge currently. What are you working on? Leave a comment below to let us know or e-mail us a picture to see it featured in a future blog post.